Koko FitClub Charlotte NC – Individualized fitness and nutrition with digital 1:1 coaching. "The thing I like most about Koko is the return on investment due to HIIT training. Long gone are the hours I used to spend on the treadmill, Stairmaster or slogging through a stationary bike class. Now I am in and out of the club in 35 – 60 minutes and on with my day, which encourages me to be consistent with my workouts. I push myself during the cardio segments because I know I only have to sustain that level of intensity for 15 minutes, not an hour. Also the strength training gives me an advantage in helping maintain a certain level of fitness. Koko provides the necessary tools for success that make taking care of myself simple, fast, efficient and most importantly effective! " "I figured it was either now or never for me so I plunged in. The program is actually easy to do on your own once you get the hang of it. But for me, I knew that I needed the discipline of a dedicated appointment and one-on-one supervised training in order to achieve success. THAT was the best decision I ever made. Not only did I have an appointment, I had the benefit of working with very caring trainers who understood ME, my muscle groups, my needs, etc. They also taught me the benefits of each exercise and each gave me different tips about staying healthy. JD and Sue’s encouraging comments made all my self-doubts disappear. I felt accomplished. I am now in my 4th month and I can’t believe that I actually look forward to my KoKo sessions. My energy is back. Am feeling like Superman. The endorphins are exhilarating. And I’m here to tell the world that 75 IS the new 55. WOO-HOO! " " I joined Koko in Dec 2014. Koko fit the type of work out I was looking for – regimented, targeted, 24/7 access and I can really get in a good cardio & weight workout within a short amount of time. In years past, I would spend up to 2 hours in a gym doing weights and cardio with not a lot of results to show for my hard work. Sticking to the Koko plan, I lost 15 lbs and toned up within 6 months! I couldn’t believe that only 30-45 minutes of a workout could show those results! Thanks to a busy work schedule, I don’t always have the same time of day available to work out. With Koko, I can choose a time that best fits my schedule for that day and that week. The best part is it’s already planned out for me. You’ll even see me at Koko on weekends or the rise and shine hour of 5:30am. 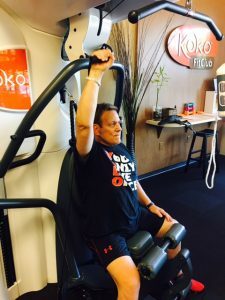 No matter what time of day I am able to work out, the Koko staff is energetic, helpful and provides suggestions for good form and new workout programs. " 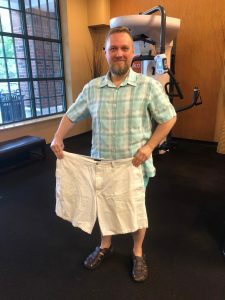 "I was skeptical about the Koko concept; yet the SmartTraining and Cardio routines were so reminiscent of my days with a personal trainer, but at a fraction of the cost, that membership was automatically a no-brainer for me. 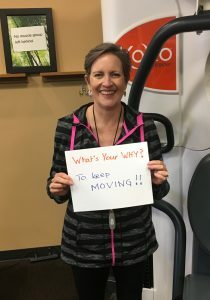 I have found that by constantly challenging myself with the vast array of Koko treadmill and elliptical cardio programs combined with strength-training consistency brings the best results for my overall health. I no longer cringe when I see the doctor, and I am now doing cardio and weights (and fitting into waist sizes) that were not possible for me in 2013. I shudder to think what my health would be like now had I not let Koko intervene and guide me through weekly, personalized workout sessions. " 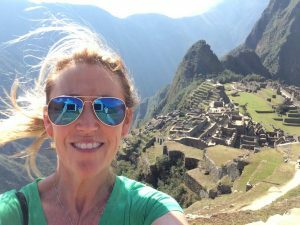 "After years of working various jobs sitting at a desk, my arthritis pain was at an all-time high. So when I retired, I decided to finally do something for myself and get in better shape. For my 60th birthday, I joined Koko. 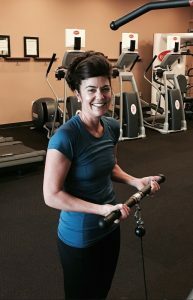 The FitCoaches were able to work around my limitations and substitute other types of exercises that would work just as well for me regarding the arthritis. In just a few months, my arthritis pain had lessened, my upper body strength improved as well as my mental/emotional well-being. All in all, it’s the best decision I’ve ever made! "